After the euphoria of August, when the market surged 27pc, a major blow to morale in September, as the market shrank 4.5pc compared to last year, ending a run of 8 months uninterrupted growth. Excluding social housing, there were 31,763 house sales in September, down 19pc on August and 4.5pc on the same month last year, according to the latest figures from the INE. 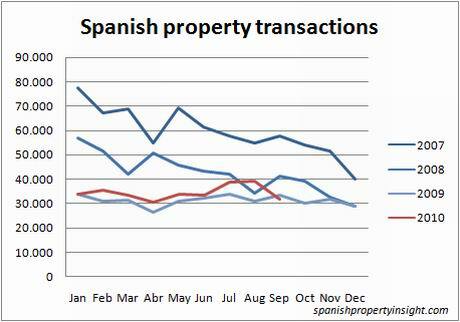 As illustrated by the chart above, September was a major setback for any talk of a Spanish property market recovery. Sales crashed to the lowest level in years after rising to the highest level in 2 years in August. Compared to last year, September sales were down 28pc in Extremadura, 27pc in Castellon (Costa Azahar), and 25pc in Granada (Costa Tropical), and 25pc in Cadiz (Costa de la Luz). 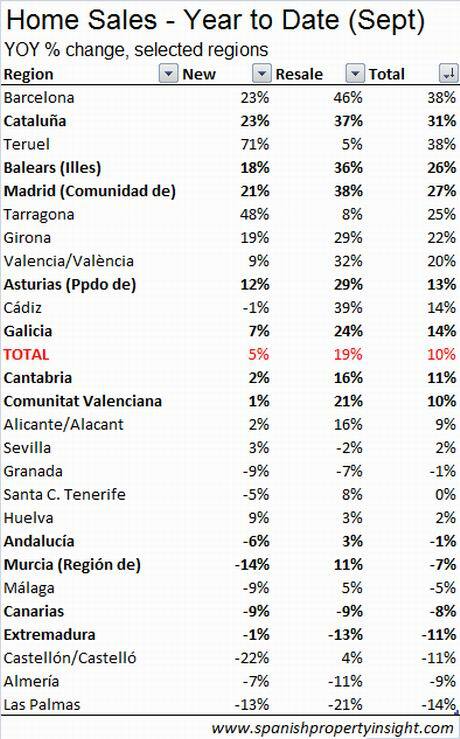 On the other hand, sales were up 49pc in Teruel, 25pc in Huelva, and 18pc in Tarragona (Costa Dorada). 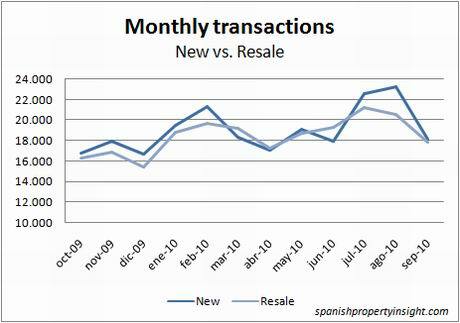 Both new and resale transactions had a bad month, but new sales disappointed in particular, dropping 10pc on last year. 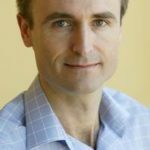 Nevertheless, year-to-date, the market is still up by 10.3pc over 2009, and we need to wait a couple of months to see if September represents a one-off or the start of a new trend downwards. The following table shows sales and rates of change in the year to date over the last 4 years. And finally, the following table shows you the change in selected regional markets in the year to date. Barcelona is doing best, up 38pc on the same period last year, and Las Palmas in The Canary Islands is doing worst, down 14pc. Heading in the right direction. Still think we’ll see transactions hit a low of 20k in 2011. Tax rebate changes (jan 2011) to look forwards to yet.